At times, it is curious to find connections between clergy in these dioceses and events and history in Lichfield and Tamworth. The Revd Walter Shirley (1726-1786), Rector of Loughrea in the Diocese of Clonfert, was a hymn-writer, and a controversial figure in the Methodist movement, supporting his first cousin, the Countess of Huntingdon, and the Calvinists who opposed the brothers John and Charles Wesley in a public rift in 1770. But his hymns and sermons were strongly Calvinist and his views were stirred intense controversy, and Shirley seems to have spent little time in his parish in Co Galway. He was a regular speaker at revivalist meetings throughout England and Ireland, earning the censure of the Bishop of Clonfert and drawing down the wrath of the Archbishop of Dublin for preaching at an independent chapel opened by the Countess of Huntingdon in 1773 in Plunket Street (now John Dillon Street), off Francis Street, Dublin. Shirley was married in Saint Mary’s Church in Dublin in 1766 and was buried there in 1786, and he appears to have spent much of his time in Ireland in Dublin rather than in the Diocese of Clonfert. He was Oxford educated, from a long line of aristocrats, and had religious views that were strongly controversial in Ireland and within the Church of Ireland. So, what brought a man like this to Ireland? Walter Shirley was born on 28 September 1725 at Staunton Harold, his grandfather’s stately home in rural Leicestershire. He was the grandson of Robert Shirley (1650-1717), 1st Earl Ferrers, who had also inherited a portion of a large Irish estate in Co Monaghan: the Shirley estate at Lough Fea, near Carrickmacross, was once the largest estate in Co Monaghan, totalling 26,386 acres. Lord Ferrers was suggested as a parliamentary candidate for Lichfield in 1677. But he preferred a seat in the House of Lords instead, and by sleight of hand and an obscure exercise in genealogy the barony of Ferrers of Chartley was called out of abeyance in his favour. His family tree is complicated, the inheritance of Tamworth Castle from the Ferrers family and the use of the Ferrers name in the titles is obscure, and the inheritance of family estates and titles is difficult to follow at times. The family tree is complicated, compounded by the claim that he was the father of 27 legitimate children and 51 illegitimate children. The Revd Walter Shirley was a first cousin of Robert Shirley (1692-1714), Lord Tamworth, who had inherited Tamworth Castle from his mother in 1697. But with Lord Tamworth’s death, Tamworth Castle and the family titles were separated and were inherited by different lines of decent. Because of these complications in the family tree, the Revd Walter Shirley was a nephew of both the 2nd Earl Ferrers, who was known briefly as Lord Tamworth, and the insane 3rd Earl Ferrers, and a younger brother of fourth, fifth and sixth earls. Walter Ferrers was educated at University College, Oxford (BA 1746). In early adult life, he was converted to evangelical principles, perhaps by Henry Venn (1725-1797) of the Clapham Sect. He was ordained deacon by Frederick Cornwallis, Bishop of Lichfield, in 1757, and briefly served as curate of Ashbourne in Derbyshire. His family connection with the Countess of Huntingdon brought him into intimate contact with the revivalist movements of the time. 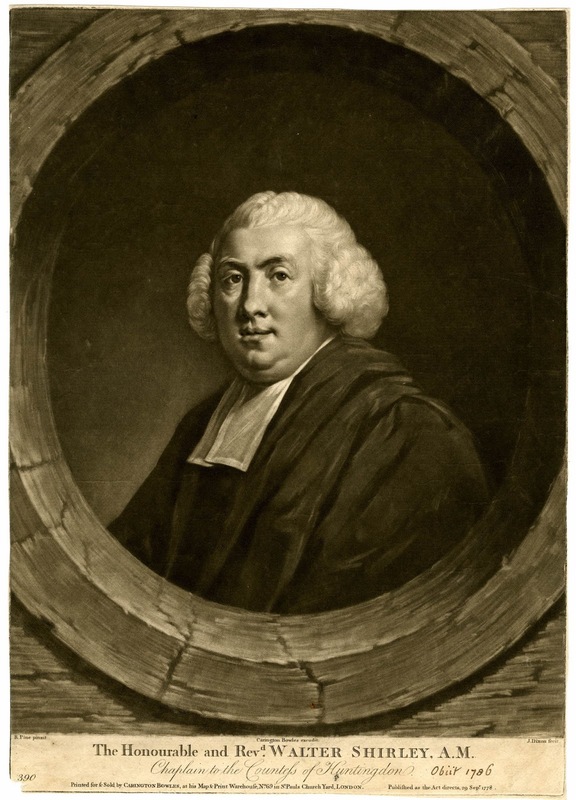 He was friendly with the Wesleys and George Whitefield, and from about 1758 was strongly linked with the Calvinists within Methodism, although he remained an Anglican. In 1760, the Shirley family was rocked by one of the great society scandals of the day, when his eldest brother, Laurence Shirley (1720-1760), the fourth Earl Ferrers, was hanged at Tyburn for murdering his steward. Ferrers was tried by his peers in Westminster Hall, and despite his plea of insanity he was convicted of murder. He was the last peer of the realm to be hanged as a common criminal. As a concession to his rank, the rope used for his hanging was made of silk. His body was then taken to Surgeon’s Hall for public exhibition and dissection. Walter Shirley moved to Ireland as the Rector of Loughrea, Co Galway about this time. The move may have been motivated by ambition, and there may have been a promise of preferment. He married in Saint Mary’s Church, Dublin, on 27 August 1766, Henrietta Maria Phillips, daughter of John Phillips of Dublin, an illegitimate son of the 1st Lord Molesworth. They were the parents of two sons and three daughters. 1, John Shirley, who was born in Loughrea in 1767 and died in Bath in 1773. 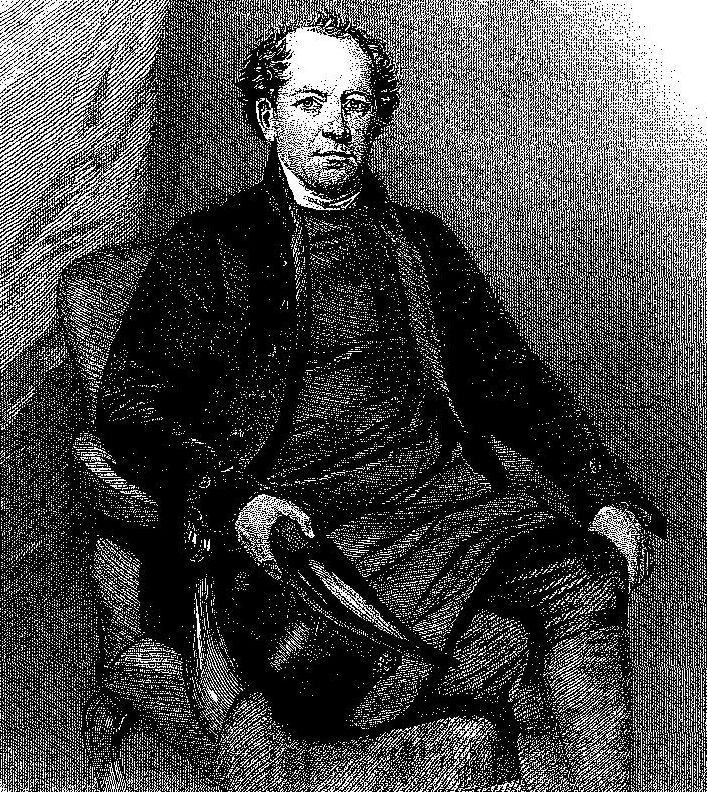 2, The Revd Walter Shirley. 3, Frances Anne, who was born in 1770 and married the Revd John Going (1766-1829), of Mealiffe, Co Tipperary. 4, Henrietta Elianor, married the Revd Henry Bunbury of Johnstown, Co Carlow. 5, Ann Augusta, married Gabriel Maturin, grandson of Gabriel Maturin and Jonathan Swift’s successor as Dean of Saint Patrick’s Cathedral, Dublin. Although some of his children were born in Loughrea, Shirley was often absent from his parish in Co Galway, mainly due to his activities as a revivalist preacher, which brought him repeatedly into conflict with his bishop and fellow clergy. He was also serving as a chaplain to his cousin Selina, Countess of Huntingdon. Shirley played a major role in the Methodist split in 1770, supporting Lady Huntingdon and the Calvinists, including the hymn-writer Augustus Toplady, against John Wesley and the Arminians. Shirley’s influence only helped to embitter the dispute. The Bishop of Clonfert, Walter Cope, censured Shirley in June 1778 and advised him to abandon his Methodism, and some clergy in the Church of Ireland petitioned the Archbishop of Dublin, John Cradock, to reprimand him for preaching in the Bethesda Chapel and the Plunkett Street Chapel in Dublin. In his later years, Shirley suffered with dropsy, and he died on 7 April 1786 at the age of 59. He was buried in Saint Mary’s Church, Dublin, where he had been married. His only surviving son, the Revd Walter Shirley (1768-1859), was born in Loughrea, Co Galway, on 11 October 1768, and was educated at Trinity College Dublin (BA). He lived at Westport, Co Mayo, and in Dublin on 26 July 1796 he married Alicia Newenham, a daughter of Sir Edward Newenham (1734-1814) of Belcamp Hall, MP for Enniscorthy, Co Wexford (1769-1776), and Co Dublin (1776-1797), and a friend of George Washington and Benjamin Franklin. Her sister Rachel married Canon John Hoare of Drishane (Millstreet), Co Cork, who was one of my predecessors as Rector of Rathkeale (1803-1813). Rachel and John Hoare were the parents of the Very Revd Edward Newenham Hoare (1802-1877), founder of Holy Trinity Church, Limerick (1834), Archdeacon of Ardfert (1836-1839), Dean of Achonry (1839-1850) and Dean of Waterford (1850-1877). Walter and Alicia Shirley were the parents of one daughter, Henrietta Jane Shirley, and an only son, Walter Augustus Shirley (1797-1847), who was born in Westport, Co Mayo, on 30 May 1797. Walter felt compelled to flee Ireland during the 1798 Rising, and he and his family had a peripatetic existence until he found a curacy first in Latchingdon, Essex (1808), and then in South Mymms, London (1814). Security came when he re-established a link with his first cousin, Robert Shirley (1756-1827), 7th Earl Ferrers and formerly known as Lord Tamworth from 1778 to 1787. In 1815, through this patronage, Walter was appointed Rector of Shirley (1815-1827), a Derbyshire parish in the Diocese of Lichfield that was in the gift of the family. Later, Walter was the Rector of Woodford, Northamptonshire, and he succeeded his own son as Rector of Brailsford, Derbyshire (1847-1859). His experiences in Ireland shaped views that he continued to hold throughout his life, and with the restoration of the Catholic hierarchy in England in 1850, he expressed strongly anti-Catholic views. Alicia Shirley died in Brailsford in December 1855 at the age 81 and Walter Shirley died on 9 April 1859. Their only son, Walter Augustus Shirley (1797-1847), was born in Westport, Co Mayo, on 30 May 1797. His father’s cousin, Lord Ferrers, supported this younger Walter going to school in Winchester in 1809. There he won a scholarship to New College Oxford in 1815, and at the same time Lord Ferrers gave his father the living of Shirley in Derbyshire. When he married Maria Waddington in Paris in 1827, his father resigned Shirley so that the younger Walter could become rector of the family parish. He became a scholar of Winchester College in 1809, and six years later was elected to a scholarship at New College, Oxford (BA 1819, MA 1823). He became a fellow of New College in 1818. 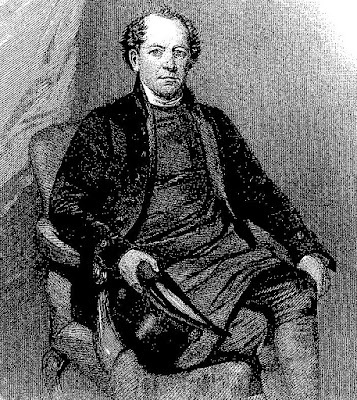 He was ordained deacon on 7 August 1820 and took charge of the parish of Woodford, one of the livings held by his father. In 1821, he became curate of Parwich in Derbyshire, and in 1822 he was curate of Atlow. He acted as Anglican chaplain in Rome in the winter of 1826-1827, and there he got to know the Bunsens and Thomas Erskine, as well as Eastlake and Wilkie. He was appointed assistant lecturer (curate) at Ashbourne in 1827, and that autumn in Paris he married Maria Waddington, the daughter of William Waddington. His father resigned the living of Shirley in his favour, and he moved there in January 1828. Shirley was reared in the strictest evangelical tradition, but he alienated some of his friends with his outspoken support for Catholic Emancipation in 1829. In later years, he lost more friends by refusing to support violent measures against the Tractarians. After nine years, he moved to the parish of Whiston, near Rotherham, but he continued to hold it with Shirley for another two years later, when he was appointed to the incumbency of Brailsford, a parish beside Shirley. He was appointed Archdeacon of Derby by the Bishop of Lichfield on 21 December 1840 and also became a prebendary of Lichfield Cathedral. He was a Vice-President of the Lichfield Architectural Society, which promotes the insights of the Gothic Revival in church architecture along the lines introduced by AWN Pugin and the Cambridge Camden Society, with close Tractarian affiliations. In November 1846, he was appointed Bishop of Sodor and Man, an a few weeks later, on 17 December 1846, he received the degree of Doctor of Divinity (DD) from Oxford. However, because of a serious illness he was not consecrated bishop until 10 January 1847. He had been elected the Bampton Lecturer for that year, but lived only long enough to deliver two of the lectures in Oxford before he died at Bishop’s Court on the Isle of Man on 21 April 1847, just three months after his consecration. At the time of his death, it was said Shirley had gained the esteem of the clergy and people in his new diocese. However, his letters indicate some strong criticism of the clergy, island ways and Methodism. Maria (Waddington) Shirley died in 1854 age 55. Their only son, the Revd Professor Walter Waddington Shirley (1828-1866) was Professor of Church History at Oxford and a canon of Christ Church, Oxford. An Anglican priest like his father, grandfather and great-grandfather, he was born at Shirley, Derbyshire, on 24 July 1828, and educated at Rugby School under Thomas Arnold. He played a part in founding Keble College, Oxford, but his career was cut short at the age of 38 when he died on 20 November 1866. Professor Shirley’s five children included Alice Shirley (1856-1911), who married the Revd William Richardson Linton, who also became Vicar of Shirley, and Walter Shirley (1864-1937), who eventually succeeded as the 11th Earl Ferrers in 1912 on the death of his fourth cousin, Sewallis Edward Shirley (1847-1912), 10th Earl Ferrers. The tenth earl, like many of his predecessors, was also known as Viscount Tamworth before inheriting the family titles and estates. His Irish-born wife, the former Lady Ina Hedges-White, was a daughter of the 3rd Earl of Bantry, and his mother, the former Lady Augusta Chichester, was a daughter of the 4th Marquess of Donegall, who had been Dean of Raphoe, Co Donegal. Previous generations of her family had also given their name to Donegal House in Lichfield, and had once inherited Fisherwick Park and Comberford Hall. Meanwhile, Tamworth Castle had long passed out of the hands of the Ferrers family. Robert Shirley (1692-1714), a grandson of the first earl and a first cousin of the Revd Walter Shirley of Loughrea, was known as Viscount Tamworth for most of his life and inherited Tamworth Castle in 1697. However, he had no sons to succeed him as male heirs to the titles, and while the titles remained in the Ferrers family, Tamworth Castle eventually passed by inheritance and marriage to the Townsend family in 1751, the year Walter Ferrers was ordained by Bishop Cornwallis of Lichfield.